Two frozen samples of carrots with different degrees of core toughness were analyzed, using the Standard-Shear Compression Cell (Model CS-1) and Model T-2000 Texture Measurement Systems with an FTA-1000 pound Load Cell. The system was set to a crosshead speed of 8 inches per minute over a 3.5 inch testing stroke..
Five small baby carrots placed perpendicular to the grids to form one layer of carrots in the bottom of the test cell. 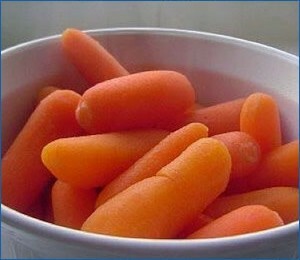 Ten small baby carrots placed perpendicular to the grids form two layers of carrots in the bottom of the test cell. Highly significant differences were detected between the two samples at both sample size. 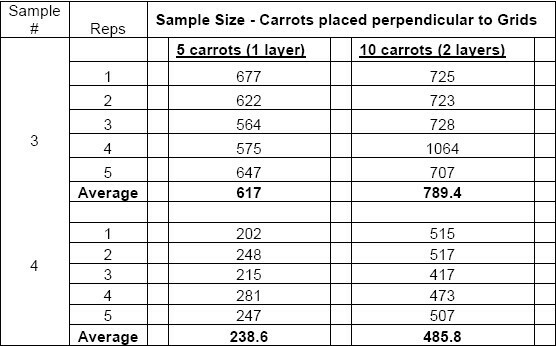 This type of test will allow the processor to measure product texture a allow grading of the carrots to suit different process types such as cooked or fresh supply.